File this under “other things you can do with fencing other than actual fencing.” Like my trick for saving shrubs from the ravages of rabbits I like to use fencing to form little cages, trellises really, around posts. Posts, poles, supports, columns, whatever you want to call them, we all have them, we all need them. They hold things up. In my case, a large bird house. Why not pretty them up a little bit and grow things on them? Rather than buying an expensive (comparatively) trellis from the “trellis section” at the Home Depot, or going the more permanent option of pounding dozens of nails into the post to act as supports, you can simply get a trusty pair of tin snips and snip off a (for a 4×4 post) 18 inch or so section of fencing. You may need two 18 inch sections depending on the height of the fence and the post area you want to cover (stacking them on top of each other) then simply wrap it around the post and secure it with the loose wire ends created when you made your cuts. Voila, a cheapo trellis that will soon be invisible behind a mountain of flowers and foliage. Then, if you ever tire of it, you simply remove it, and the post is no worse for wear. I do this with clematis, as you can see in the picture. The vine is simply planted at the base of the pole and climbs it mostly by itself, I only have to do a little guiding, and that is usually limited to just tucking wayward stems into a section of the wire frame. The vine you see in the picture is just 1 year old, so not yet at full coverage, plus, it is still May here in zone 5, we had frost last night (grrrrr), so the growth it has is really impressive considering. I expect it to achieve full coverage by the end of the season. You can also do this with morning glory readily, as well as any other flowing vine that doesn’t get too woody or large. For instance, I wouldn’t do this with trumpet vine or wisteria, think smaller, those both get too big. i love this trick. it’s very elegant looking. That’s an awesome idea. It will be a huge help with the giant pole at the side of my back yard. Good idea on the fence. I liked your idea for the clemetis – I’ll have to try it in my garden. By the way I have a website on gardening too. It is superbgarden.com check it out and feel free to leave any information you would like. Thank you again for the good tip. 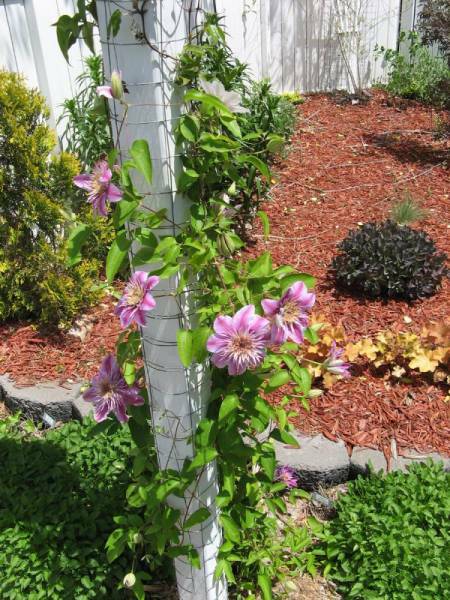 Love this idea for the clematis. Putting a couple of posts with flowering climbers around your garden will make it a lot more interesting. Great idea.